How cool is it that this is number 333 post? I loveeeeee the number three! Always have, always will. He is cute and springy and sweet and funny. Number three rocks. And there are three number threes! It’s like the threes are celebrating the fact that I received my “official” diagnosis! Yes, indeed…. Who would have guessed, but a psychologist has concurred (very kind man) that it is true, I am Aspergerian. So it’s official; whatever that means. Oddly enough, the whole validation of my “condition” was anti-climatic, as I was in a very serene and calm mood during my last appointment. I kept waiting for the jolt of “Yeah, Baby” to hit me. But alas it never came. I analyzed this lack of Wow-Factor for quite sometime, and concluded this balance of emotions was a positive and beneficial thing. 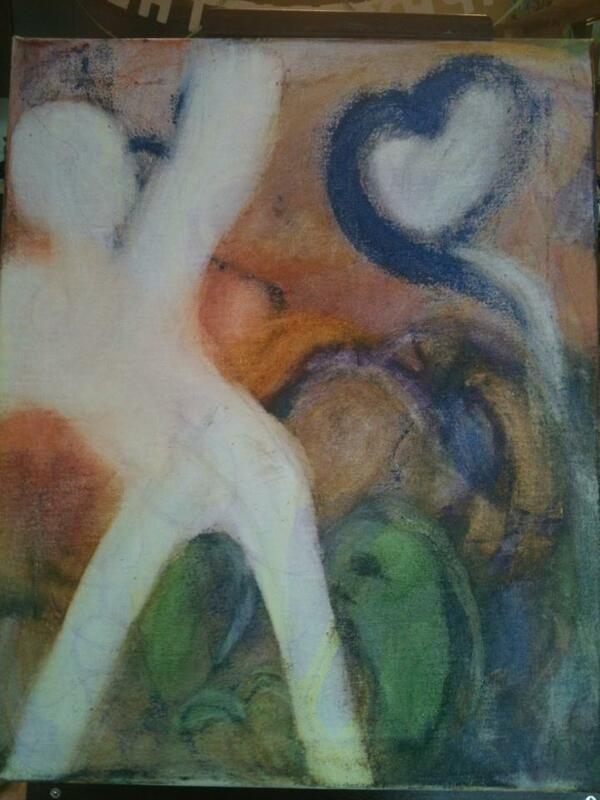 My freedom of self is expressed quite clearly in this recent painting called Surrender. More recently, three hours last night, and two hours this morning, I worked on this piece. It is filled with emotion and energy for me. This one is called Home. Interestingly, when I paint, I am mostly using a paper-towel as my tool. I start of with drawing free-formed designs with a pencil, letting spirit move me. Then I add some paint in globs. Then I rub off the paint and see what starts to pop out. I follow no rules and use odd techniques. Mostly, I feel like a genius-sculpture waiting for the canvas to speak to me. I have a unique perspective on images. I see things in my paintings and strongly, to the point of distraction and physical sensations, feel the energy. I didn’t like this image in my original painting. The shape seemed dark to me, almost evil. It looks like a dead animal or beast. I had to remove this by erasing with water and adding more paint. This image really bothered me, too. Often parts of my works feel heavy and unfinished, and I have to erase, reapply, and step back. 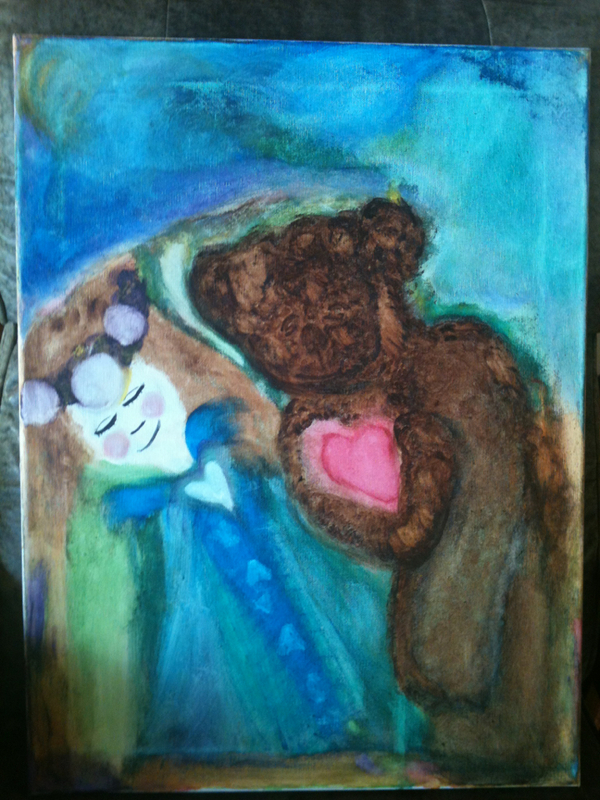 If I see an image I don’t like in a painting, like this one above, of a succubus hooked on to the teddy bear’s head, I have to restart and free the energy. I have to remove the energy vampire, so to speak. I feel this energy intensely, and feel it is either attached to me, a loved one, or both. So I rework and rework the piece until the energy is released. I can recognize so much healing during the process, and I become almost hypnotic and lost in my creation. 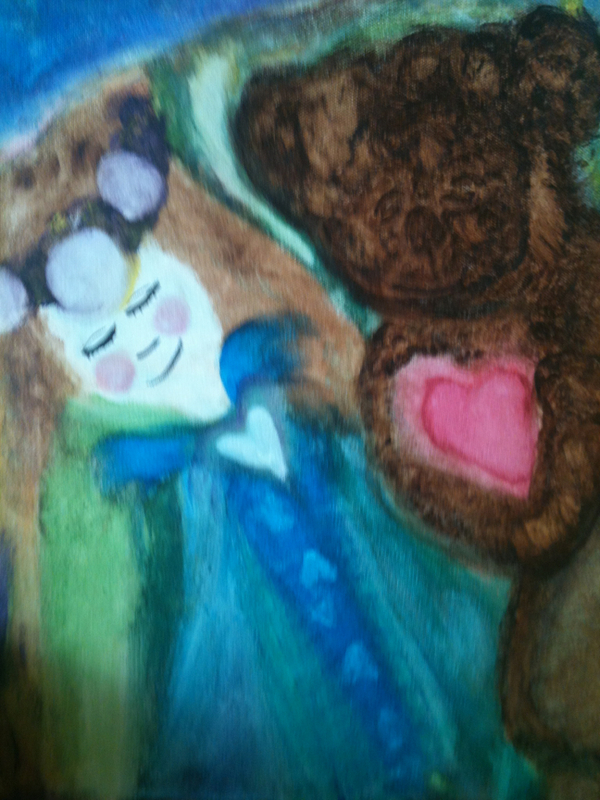 The painting experience is similar to writing, wherein I cannot use certain colors, brush strokes, angles, shapes, etc. (with writing it is words, sentence structure, rhythm, etc.) without feeling a blockage that I must remove. For me, everything in life is alive with energy: words, colors, shapes, feelings. All in all, the art of painting is becoming a soothing mechanism for me both energetically and emotionally. 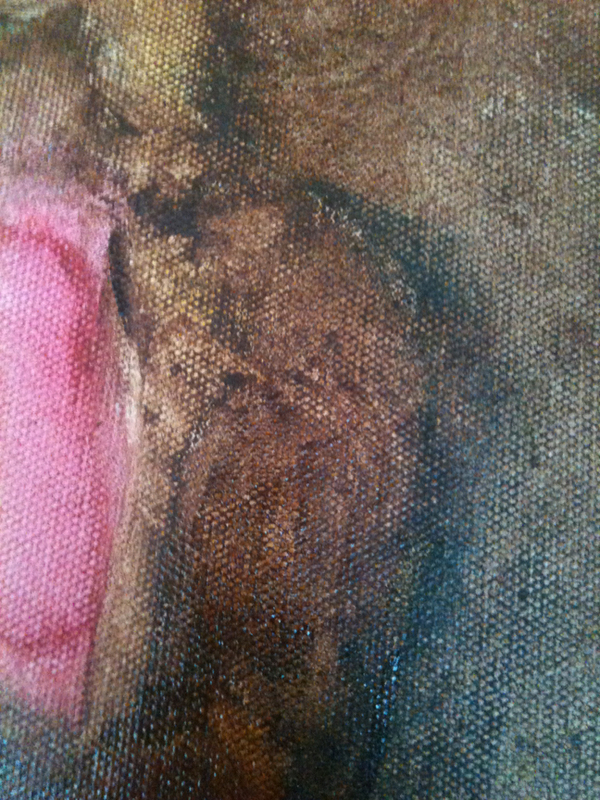 I am pleased with this new Painter aspect of me: the breaking through of self and displaying of self on canvas. It is another form in which I feel someone might be able to see me beyond the facade of my human flesh/costume. I still find the creation of faces doubly-daunting, as I cannot grasp faces, not others’ and not even my own. So I am struggling with the releasing of “face.” A concept I find mimics my own personal trials: That of releasing the image of self. I have a great sense of peace, as of late; partially because I stopped taking this hormone pill that was making me have complex, rapid thoughts (can you imagine!! as my thoughts are already so complex! )…induced hyper-thyroid. But mostly because I have started to listen to my own self. I have started to believe in the magic of the world again. I have started to see that inside of me is so much beckoning to get out. And I have chosen the magic over the misery. Something that is long overdue. My fascination with the number 3 is very old and powerful. Seems it’s almost a genetic trait in my family. hehehe I be LEGAL….. wow! Now I am freeeeee for the universe to pour in more good stuff. Hugs to you beautiful deep soul. Hello my lovely Basna, I laughed when I read “succubus” giggle. Then again at “energy vampire” You know why….hehe. Love you, you total Aspie you!!! Yes, indeed, I know why! Love you angel heart, banana slug, alien guru! There is that woman who does the small angel, mother, child sculptures that have no faces. They bother me, but others in my family just love them. 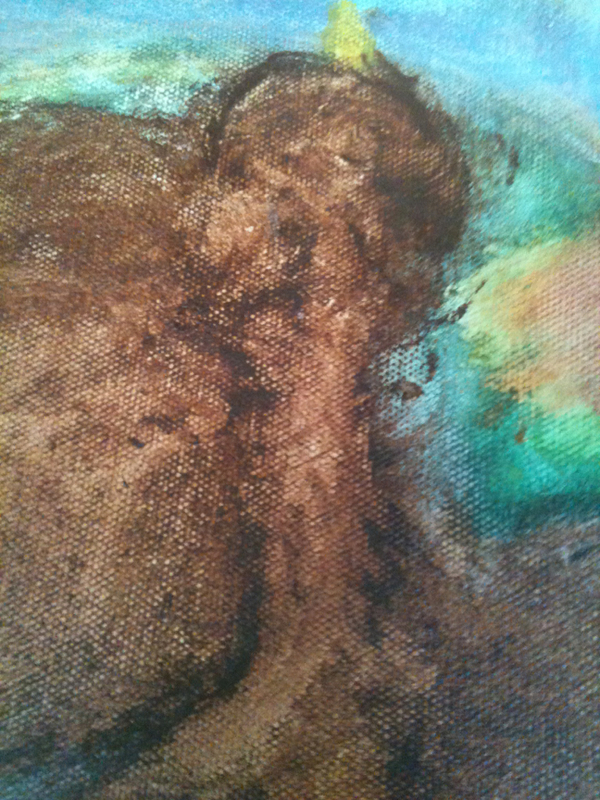 I have been seeing faceless angels when I am out shopping now. lol. Okay, something new to focus on…… Thanks for your continued support Kindred one. “The magic over the misery”…I like that, sometimes, I’m almost afraid to enjoy the magic, afraid that I’m not allowed to. Who is it that ever said to me, ‘dont enjoy!’ I’ll have to figure that out. Thank you for saying that you are enjoying…it makes it feasable, makes it o.k. if others are doing it and surviving the feeling of happiness, fascinating. Thank you Bubbles :))))) Yes…interesting mix indeed. Best wishes to you. I LOVE your painting Sam! I’d like to buy it! Do you ever sell your creations? Yay. Thank you :))) I just started painting a few months ago. Have not sold any. But what a sweet thing to say. Well I’m serious about this painting! You don’t want to sell? Pleeeeeease? I really love it. It speaks to me so deeply! I have it as my wall paper on my iPad! Please Sam…..consider doing another for sale…..a commission, if yo will. Let me know, ok? I don’t know what it is about that but I LOVE it. If I do one with similar feel, colors and energy, I will let you know. :))))) I poured a lot of love into this one. You might have felt that. hugs. How sweet. I am so glad it brings you happiness.